FRESNO, Calif. (KFSN) -- December 7, 1941--a day which will live in infamy and a day retired United States Navy Chief Petty Officer James Hodge can still recall pieces of at 100 years old. "They went on the ship I was on and some man took us in," said Hodge. 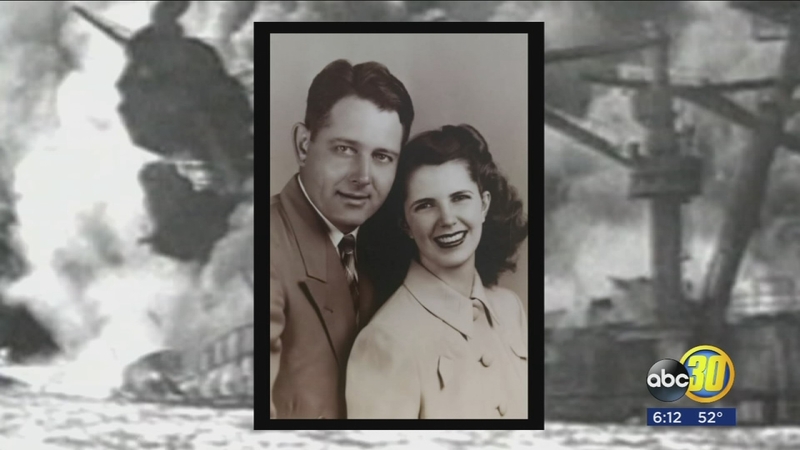 Hodge was aboard the USS California when it was torpedoed and bombed by Japan--while he was injured, he assisted sixty-two others injured on board his ship and in the water and helped in the recovery process of 100 bodies. "It creates admiration obviously you're proud as family members and somewhat in awe of someone that gave so much to his country. The chief boatsman mate was hospitalized for his injuries but reenlisted in the navy--then just one year and one month later he survived another torpedo hitting the USS Chicago. That is where family members say his best friend died in his arms. But he did not stop there. Hodge served throughout the rest of World War II. After 23 years of service Hodge eventually retired after an injury in 1959. "That would be pretty cool just to tell my class oh my grandpas in Pearl Harbor," said Hailey Reynolds. On the 76th year mark of the Pearl Harbor attack, the veteran was honored at the VA Hospital in Fresno where he was surrounded by his family and fellow veterans. "This right here is one of the reasons we're here," said Ventura Franco. Although he lost most of his hearing since the war and suffers from mobility at 100 years old. Hodge is still able to honor his country with everyone who came to honor his service. "He's truly once an officer always an officer," said son-in-law Weldon Killion.